UK Radio Scanning Forum • View topic - Airband antenna on ebay. I spotted the following on ebay & it looks like a well designed & decent airband antenna for a change. Commercially made from aluminium, much more sturdy and weather resistant than copper homemade versions on the market. 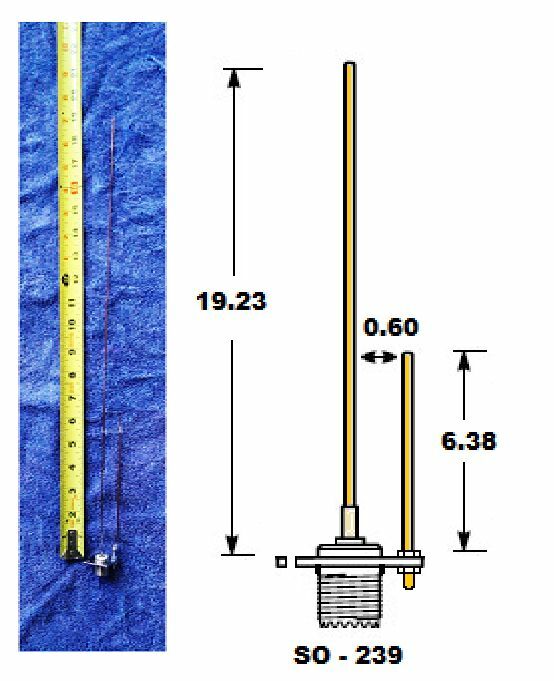 The airband J-Pole antenna is tuned for the 118 – 137 MHz aircraft band. Aviation fans prefer this antenna as it works well picking up both land based towers and airborne aircraft. It is also great for receiving Acars Aircraft Position Transmissions. Tuned to approx 127 MHz, SWR below 1.5:1. We rigged this antenna up to our aerial analyser (rig expert aa170) on a 15ft mast pole and obtained a SWR reading of 1.05 at 127MHz (see images) therefore perfectly tuned for the Aircraft Band. This antenna will give you about 2.5 db of gain more than what you would get with a discone antenna. J-Pole advantages for aviation is that it has a very low noise floor due to it being DC shorted. It has an RF radiation pattern that is almost donut shaped, great for omnidirectional reception. It does an great job at picking up signals below and above the horizon line. That means you should have no problem receiving tower transmissions from miles away as well as aircraft transmissions from 100 miles or more. It is fairly easy to make a J Pole yourself, but this is at least made from decent quality materials & by someone who looks like they know what they are doing. Something that is certainly not true of all commercial scanner antennas or their makers. Re: Airband antenna on ebay. I can't quite see how this is a J-Pole? - intriguing? G4RMT wrote: I can't quite see how this is a J-Pole? - intriguing? Why? I know there is no bottom linking section, forming a phsyical letter J. But the original design was simply a quarter wave matching stub & a half wave radiator. It's VHF/UHF variation of the off Centre Fed Dipole & Zepp. An Antron 99 is in effect a J pole type antenna. Or, I have an image of a VHF vertical which is a half wave over a coiled quarter wave in my RSGB VHF/UHF handbook. And that is what an Antron 99 is, a half wave over a quarter wave & several designs feed the J at the base of the matching stub. There are lots of variations. The following image is a simple J Pole. Nothing to do with the above. Just a interesting fact. Fred Judd in his original Practical Wireless design for the Slim Jim, writes that the JIM stands for J type Integrated Matching stub. Ive purchased one of these last week, it arrived 2 days later. Yes its a Jpole, i popped one of the end caps off and looked inside the poles, its has a bar shorting the two poles out at the bottom, is covered in plastic (the bottom black part), I think it covered in plastic to make it rigid. The two poles read a dead 0 ohm short on the multi meter and it reads a dead short on the so239 connector, so its definetely a J Pole and DC shorted which is great for my RTL SDR as it does seem to be less noise, maybe less static from my computer power supply interfering?? I tried for the first time listening and decodong ACARS today and its pulling in signals very well. The chirps im hearing seem really strong. Im also receiving a lot of activity on the air band compared to my scanking scanner aerial, infact its made me realise how rubbish my scanking is compared. Im really happy with it and would defo reccomend. Only thing that would be nice if the so239 section was moveable so i could retune it to other bands. I also bought one of those J pole Fitting connectors the guy is selling to make my own J pole. This is also decent qaulity, I would recommend. One silly question..... Because im not transmitting with this antenna do I still need to put the turns of coax to form a balun? It doesnt seem to be making any difference either way ??? Last edited by barrylewis1234 on Sat Jun 02, 2018 11:46 pm, edited 1 time in total. barrylewis1234 wrote: One silly question..... Because im not transmitting with this antenna do I still need to put the turns of coax to form a balun? It doesnt seem to be making any difference either way ??? The coils make a simple air wound choke which stops RF from getting onto the outside of the coax & the coax thus becoming part of the antenna. And the coax being part of the antenna is NOT always a bad thing. Some antennas are designed with a specified amount of coax being part of the antenna. But air wound chokes are very narrow band & need to be calculated using the specific impedance & velocity factor of the coax & the frequency needing obstruction. As not all coax is equal. Although a simple couple of loops seems to be a good preventative starting point to help avoid problems on a VHF TX antenna. It is normally much easier to put a couple of potentially preventative loops in the coax when putting the antenna up, than doing it days later. The fact that you are not transmitting does not mean Common Mode Current cannot exist on your coax. A close by high power TX, can do it for you too. You can also get noise at the reciver through running your coax close to other electrical fields, such as electrical cables & electronic devices that are electrically noisy. And you seem to found the answer for you already. In practical terms the choke is not giving you anything. If your noise floor. That is the level of noise on your receiver, was very high, then a couple of loops of coax through a clip on ferrite just before the radio would make more sense than one at the base of the antenna. Ive included 4 turns on the coax at about 4 inches diam. Ive not put the jpole on a mast, ive used a tv wall braket and fixed it directly to the facia board at the peak of my roof. Ill get some photos to show you this week. its working really well today as ive been decoding pocsag pagers to, another rtl sdr projective wanted to do. Although these are on 151 mhz this j pole is still pulling them in really nice and strong, im really happy with it. The same seller has added a jpole kit if you fancy making your own.